Kumar Abhishek develops new additives in the lab. Credit: 2016 EPFL. A new additive synthesized at EPFL can impart the desired consistency to mortar, concrete, and cement, all in a single step, whether it is with respect to hardness, drying time, or uniformity. The additive is produced using inorganic compounds, and can also increase the lifespan of buildings. A startup known as Nanogence has recently been formed to develop and market the innovation. Soon it will only take a single step for manufacturers to set the properties of construction materials during preparation and improve their properties once hardened. Nanogence (an EPFL offshoot) has produced a sole additive that is sure to substitute the plethora of additives currently used to obtain an ideal mortar, concrete, or cement. This additive can even avoid deterioration of the reinforcing bars, increasing the lifespan of buildings. Concrete might seem to be singular as well as unchangeable to the uninitiated, such as a pedestrian who thinks it is simply straightforward and without any secrets. However, preparing concrete involves balancing a combination of parameters that vary from one company to another, as well from one batch to the next. One of the basic ingredients in preparing concrete, clinker, can differ based on the natural environment of the rock from which it is produced. Additionally, the temperature to which clinker has to be heated, its residence time inside a kiln, cooling conditions, as well as cement-mixture composition may also vary. Manufacturers generally customize the cement they produce according to the building for which it is intended as well as the time needed to reach the location. For example, if it’ll be used for a building in the middle of a large city, it needs to harden slowly so that builders can still work with it despite the time it will take to get it to the construction site. This means that cement is typically enhanced with differing amounts of various additives until the perfect texture is obtained. The sole additive synthesized by Nanogence represents a mini-revolution for the construction field. Manufacturers will have to just adjust the proportion to obtain the desired consistency. The fact that the additive is inorganic (i.e. carbon-free) avoids the porosity problem that causes carbonatation and ultimately deterioration of the concrete. This problem is caused due to the carbon links as well as moisture that can seep into the minute cracks between the metallic structures reinforcing the building and the debris contained in cement. The inorganic compound synthesized by Kumar can overcome this problem, extending the lifespan of the buildings. The additive also enhances the hardness of construction materials, which means that builders can make thinner walls, reducing the amount of concrete used. The resulting savings are remarkable because it is a known fact that concrete constitutes around 5% - 10% of carbon emissions, yet it is one among the world’s highly used and less expensive construction materials. So what is the “miracle” behind this additive? The basic concept behind the new procedure surfaced as a result of Kumar’s thorough knowledge of the nanoscopic structure of concrete. 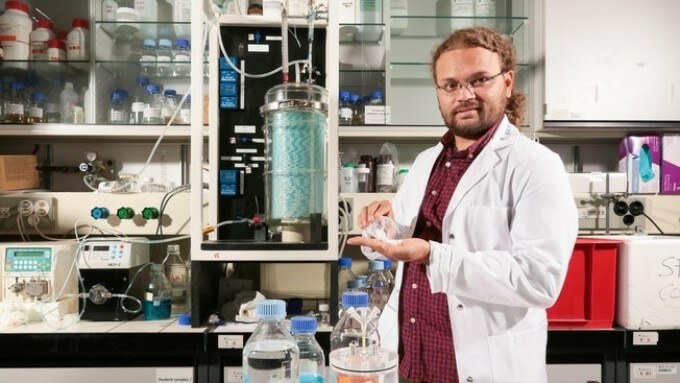 He gained this knowledge while working on his thesis, and later employed nanotechnologies to synthesize chemical substances with the ability to enhance concrete’s characteristics. Nevertheless, the formulation of the substances must certainly remain confidential. Kumar launched the startup this summer, after registering two patents. Currently discussions are underway between Kumar and two major European concrete producers, and he has also started synthesizing a compound particularly suited for white concrete. This ideal market is specifically targeted toward high-end interior decoration. However, Kumar is not in a moot to settle down with his honors. He is working toward synthesizing an additive that can enhance thermal insulation of concrete. The idea is to eventually develop prefabricated elements that combine longevity with good thermal insulation. Over 40% of energy worldwide is used for construction. Rethinking construction materials will hopefully enable us to reduce this usage. Apart from winning the startup awards from the European Venture Program (EVP) and the Academia-Industry Training program sponsored by EPFL, Swissnex, and Venture Lab, Nanogence has also acquired an Innogrant and an Enable grant, which is an EPFL program to aid laboratory researchers in bringing new products quickly to market.